If you are close enough to spend time with my family, you are going to find out how much I believe in the power of AWANA. My children have been going for several years now, since Clara and Jonathan were beginning Sparks. But more then just attending, we purpose to put a real emphasis on Scripture Memory in our daily lives. Every day is supposed to start with Bible Study and Memorization! I expect my children to finish their books each year, and I put a lot of effort into helping the strugglers reach their goal. Hiding God’s Word in our hearts is not optional! Through our years in AWANA, God continues to bless us with wonderful leaders for our children and for the AWANA programs at our churches. Specifically, AWANA at Blue Ridge Bible Church was amazing, and the volunteers from church and from the nearby Patrick Henry College have made a lasting impact on the lives of my children. In fact, my two oldest children still reference their leaders and the director fairly often in our day to day conversations! 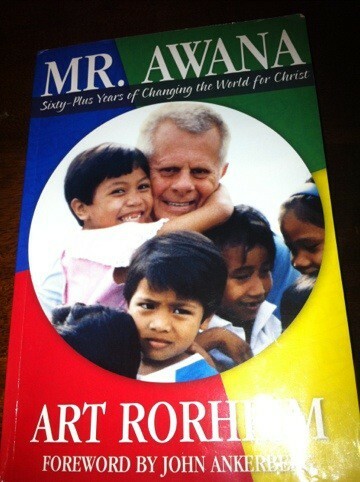 Reading Mr. AWANA gives me a whole different perspective on this wonderful ministry and outreach. I believe every AWANA director should purchase copies of this book and loan them out to the leaders. Art Rorheim shares so many wonderful memories about God’s work in AWANA from the humble beginnings through today. I have very much enjoyed reading his work and appreciate his perspective on the importance of Scripture memory. I do have to admit that I am do not agree with Mr. Rorheim on every subject especially concerning Sunday School and church camps. I find his attitude about evangelism to be wonderful though and I think everyone can learn about following God by reading Mr. Rorheim’s book. Since the book reads like a collection of essays and speeches, I did notice quite a bit of repetition but this did not detract from my overall enjoyment of this book. My Bottom Line: If you are interested in leading a life used by God you will enjoy this book and be encouraged! If you are convinced that AWANA has a high value in the life of our children, you will enjoy this book! LOVE this review! I will get a copy of this book asap and pass it along to our leaders too. And, your kids ARE missed each year. Their ability to memorize and finish their books is legendary 🙂 Sending Virginia love to you all!